Gambling: When Does it Become a Problem? 1. Hiding a gambling habit from others. This could be for a number of reasons ranging from wanting to surprise someone with a big win or hiding a habit because of a belief that others will misunderstand and judge. This is a telltale sign that someone’s gambling habit is becoming more of an addiction. Not being able to control the impulse to gamble is one of the biggest indicators that there may be a problem. This is what gambling addictions have in common with other drug addictions,where there is a loss of control over when someone gambles. 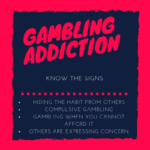 Often, the gambling addict cannot stop gambling after they have started; they also fall into a chain of gambling by chasing losses or continuing to gamble in order to regain money that has been lost. 3. Gambling even when you cannot afford to. This is often how people who have a gambling addiction get into trouble, because they will go through any means in order to continue gambling. This is often when gambling addicts run into legal trouble, because they will resort to stealing, borrowing or selling possessions, commiting fraud, or obtaining illegal loans so that they can continue gambling. When family and friends start to express concern over an individual’s gambling habits, it is a significant warning sign because friends and family often know that individual the best. Once family and friends notice changes in behavior, they can help the individual find a path for treatment of the gambling addiction. When suffering from a gambling addiction, denial by the addict and among friends and family only allow the behavior to continue, making everyone’s acknowledgement all the more important. Gambling is not an easy habit to combat, but with the help of trained professionals, and through lifestyle changes, it is possible for people to overcome their gambling addictions. If you or someone you know is struggling with a gambling addiction, please feel free to contact the professional team at Lifeline Connections for help! Getting yourself help, whether it is through self-help or by reaching out to professionals is an important part of recognizing that you are struggling and is a good step forward to get the help that you need. You can visit Lifelineconnections.org or call 360.397.8246 for more information.